Gertrude “Gertie” the South African Bourbel. She loves all these guitars and sits with me no matter day or time while I practice and play, that’s me with her. PRS Hollowbody ii Piezo – the best of both worlds, Klos guitars blue carbon fiber. Sadie the rottweiler. What can i say – this dog is special and goofy in every way you can imagine. Photo credit to William – who is actually pictured in the middle row of the pictures on the wall wearing the green lacrosse hat and the bottom right with his surfboard at age 9 (4 years ago). I have always wanted to learn guitar. I started with a few cheap guitars and the fenders to the right. 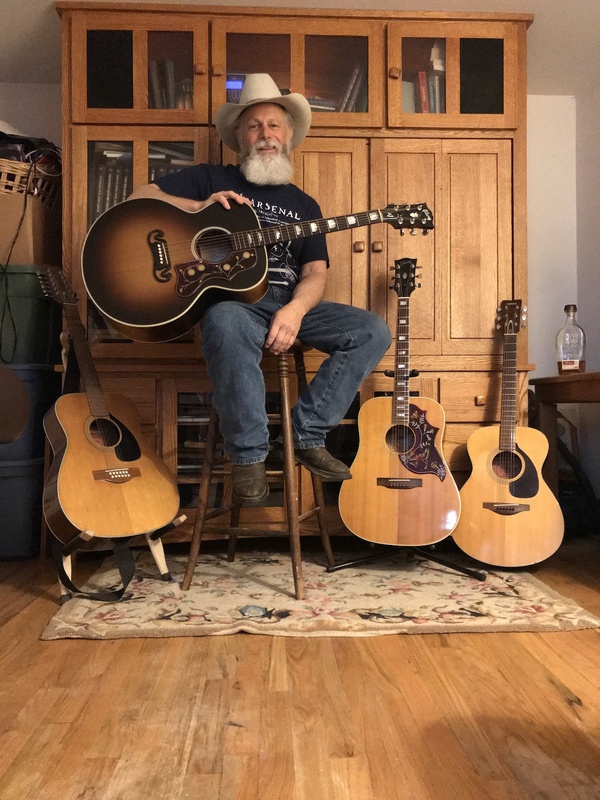 After years of never doing it, my wife made me give them away… I gave away the cheap acoustics (not the american fender electrics) to keep the peace, but it was a reminder of my “failure” to do something I wanted to do, and it never sat right with me. Meanwhile I was struggling with some goofy food allergies that cost me my memory for about a month, not to mention tearing muscles and tendons off the bones for no reason for about a year, and I desperately needed something to get my brain jumpstarted and firing again. 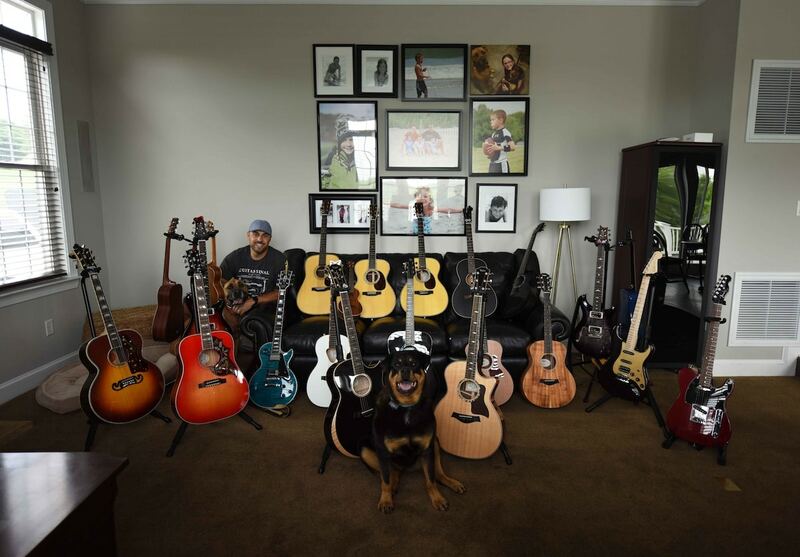 That’s when I stumbled across Tony’s Acoustic Challenge, and the Guitar Acquisition Syndrome ignited (within 2 weeks of getting rid of the guitars my wife made me unload). After 25 years being together, neither of us are surprised by my ability to get rid of 2, and replace with 20… and counting. I hope you enjoy this collection as much as I do. Stop by any time to play! …and my favorite: The one I’m playing; only to be outdone by the one I’m about to play; only to outdone by the one I’m about to buy.